My friend Glenn and I are really big fans of night-riding we keep going through the winter and we often compete for who can get the most lights on their bikes. While it’s just plain fun to be glowing at night, it’s also just plain safer to be more visible to motorists. One of our big topics has been about the possibility of lighting up a bike’s tubes–during long rides we’ve discussed everything from Christmas lights to glow-in-the-dark paint. 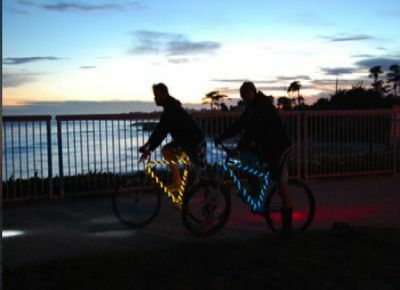 It looks like we’re not the only ones thinking about great ways to light up the frame of a bike as a company called Bike Glow has introduced a new luminescent light strand powered by two AA batteries and at ten-feet long is able to be wrapped around a bike’s frame for a light, bright solution to cross-visibility. The lighting system is available on their site or directly through REI stores and online. For $25 it’s cheaper than many of the bike light systems on the market and considerably lighter as well.